This fine and early example of an altazimuth theodolite has some detailing that is interesting in itself and typical of its maker, Erasmus Habermel. The clever provision of additional functions was clearly prized in fine instruments, perhaps in those that would be more enjoyed for their ingenuity than used to practical ends. Here the instrument can be removed from its mounting and the supporting structure for the vertical semicircle can be replaced by an extended arm with a linear scale. 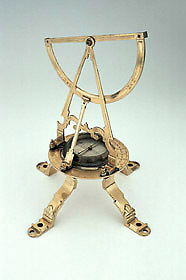 In this configuration the surveyor has a protractor, for setting out on paper the angles previously measured in the field. A second feature of note is the plumb-bob. Usually separate plumb-bobs are missing from surviving instruments. Here the maker has guarded against loss by screwing it into a cross-piece to keep it on the instrument, or perhaps by providing a spare. Either way, the idea has worked and the bob has survived.